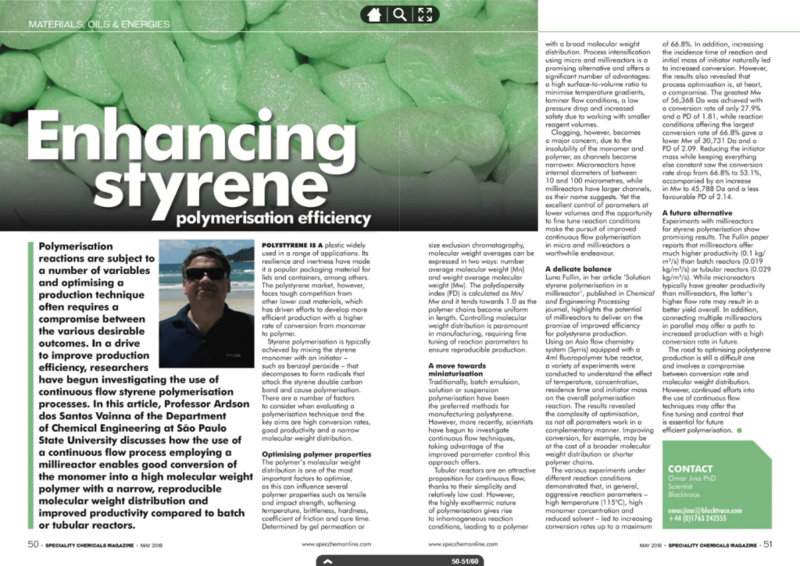 Professor Ardson dos Santos Vianna, Department of Chemical Engineering, São Paulo State University, is using a Syrris Asia Flow Chemistry System to enhance the efficiency of styrene polymerization in an effort to improve the production of polystyrene. Polystyrene is a widely used plastic for a range of applications, particularly as packaging materials due to its inertness and resilience. However, the introduction of other lower cost materials has driven new efforts to improve the efficiency of the production process of polystyrene. The polymerization of styrene is typically performed by mixing the styrene monomer with an inhibitor such as benzoyl or peroxide; the inhibitor decomposes to form radicals that attack the double carbon bond of styrene and cause polymerization, and it is this conversion that Professor Ardson dos Santos Vianna improved using flow chemistry methods. Professor Ardson’s continuous flow polymerization process employs millireactor and microreactors and enables good conversion of the styrene monomer into a high molecular weight polymer with a narrow, reproducible molecular weight distribution and improved productivity compared to batch or tubular flow reactors. Styrene polymerization is a process optimization compromise as not all parameters complement each other; improving the molecular weight distribution may result in a reduction in the conversion of styrene monomer to polymer, for example. Working with the Asia Flow Chemistry System enabled Professor Ardson to perform fast screening of reaction parameters, greatly speeding up the optimization process. Additionally, the minute changes in temperature, concentration, residence time, and inhibitor mass that continuous flow provides enabled Professor Ardson to narrow down the optimum reaction settings. Interested in learning more about polymerization, its uses in industry, and methods of performing polymerization chemistry? Discover our Polymerization Applications page here.